Two months ago My Favorite Things had one of my absolute favorite releases. But I was late in the game ordering my products, so I am just now getting to play with them. I am so loving the nautical stamp sets and dies. 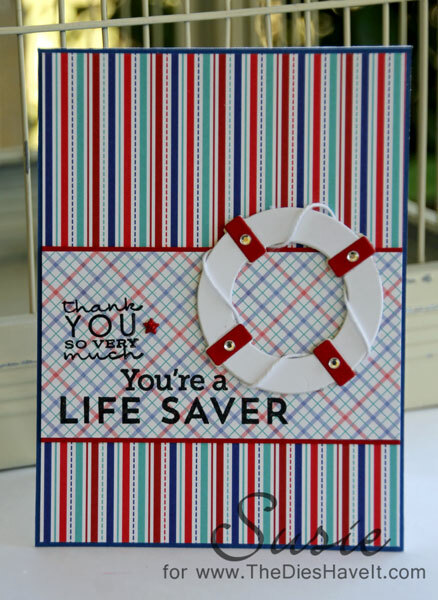 This life preserver is a two piece die so that the little red pieces can be added to the white ring. Brilliant! The large sentiment is from one of the MFT stamp sets. The smaller one is from PaperTrey Ink. I like mixing stamp sets - both old and new! I can't wait to use these MFT stamps and dies some more. You will be seeing plenty more cards using them!